When North Korea threatens to attack South Korea or fires missiles into the sea, the press reports are typically accompanied by pictures of military parades like the one below. I am wondering if I am the only one struck by the contrast between the missile pointing skyward and the decrepit truck underneath. 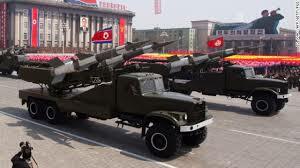 Once again it is clear that North Korea only spends money on what its leadership cares about, so the best they have of trucks (and trucks can be used to carry food and other useful tasks) is far inferior to their missiles. Through economic isolation and diplomatic pressure, many nations are trying to make North Korea back off from its program of developing nuclear warheads, re-starting nuclear reactors and fuel processing facilities, and improving missiles. But one might ask, what is the point? The knowledge on how to make nuclear warheads and missiles and operate nuclear reactors is already there. Stopping the program just means a pause; it can be re-started any time the leadership pleases. In fact, there is talk they are planning to re-start a nuclear reactor that was idled in an earlier treaty. So, it would appear that North Korea can give no credible promise that a stop will be permanent, which suggests that other nations cannot reward it for stopping either. To see why it still makes sense to call for a stop, we need to talk about violins for a moment. In a paper in Organization Science, Gino Cattani, Roger Dunbar, and Zur Shapira discuss why nobody makes violins like the peak period Cremona violins anymore, although they are now seen as the best instruments that exist. These are the violins made by Stradivari and Guernari that are owned by the richest and played by the best (usually on loan; the richest and the best are different people). Current violin makers can get close to their sound, but they cannot reproduce it. Why can't these violins be made anymore? Cattani and coauthors point out that they became famous for their sound much later than their actual creation, as a result of music performance moving from small spaces in courts to larger concert halls or outdoor performances. That condition, which is how top-of-the-range violins are used now, is where they are superior. But something happened on the way to fame: the masters building the violins died and their workshops stopped producing them. Molds and some other technical knowledge persisted, but tacit knowledge disappeared. This tacit knowledge has proven impossible to recover completely, even by violin makers who have significant experience maintaining Cremona violins. It has something to do with wood selection, preparation, and varnish, and how to use those in combination. Now let us go back to disarmament. It is clear that much technical knowledge and documentation can be preserved from a nuclear program and a missile program, and some machinery can be kept in working order. But even today, making highly complex items call for tacit knowledge. If tacit knowledge is not used, it will decline, and the ability to re-start the program will gradually wither away. So there is merit in stopping, even if there is no credible promise of re-starting. Indeed, it would not be surprising if North Korea encountered difficulties in re-starting its idle nuclear reactor. Cattani, G., R.L.M. Dunbar, Z. Shapira. 2013. Value Creation and Knowledge Loss: The Case of Cremonese Stringed Instruments. Organization Science, articles in advance. Postscript: I am aware of the research showing that a sampleof modern violinists chose a modern violin over a Stradivarius. It might suggest that there is some brand value embedded in the experiences that violinists and listeners get from a Stradivarius. But it could also be because playing a violin in an Indianapolis hotel meeting room wearing welding goggles is not an ideal way to assess a violin that plays best in concert halls.